This year, “Transforming the World by Living as Peacemakers” was Bishop Timothy Whitaker’s central theme for the Florida Annual Conference at the Tampa Convention Center. 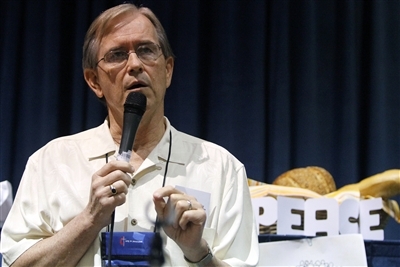 Prior to the start of the Conference, a series of workshops was offered for those wishing to explore exactly what peacemaking might mean in the day-to-day lives of United Methodists. Two of the six workshops offered a glimpse into how peacemaking can be carried out in terms of deliberate inclusive relationships. 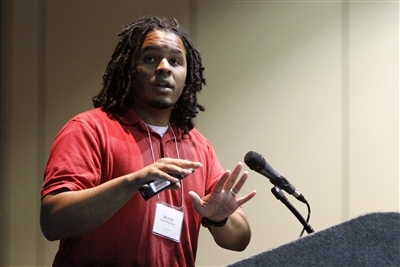 “Becoming Beloved: Toward a Discipleship of Anti-Racism and Inclusiveness” was led by the Rev. Victor Cyrus-Franklin, assistant pastor at the interracial East Point (Ga.) First Mallalieu Church. His vision for ministry has emerged from life experiences that associate peacemaking with the principles of integration and inclusivity. “How about we actually get to know the people we’re sharing space with?” Cyrus-Franklin suggested. The original thrust that merged the East Point congregation he serves – one white, one African-American – was economic. But the result is a community of believers who share the same space. But peacemakers don’t stop at desegregation, Cyrus-Franklin observed, they move into integration. For Cyrus-Franklin, the ultimate fruit of transformed relationships is “becoming the Beloved Community.” He is concerned that even so-called progressive ideas such as declarations of “color-blindness” contribute to the problem because they can suggest that race doesn’t matter. Last summer, Terry Jones, pastor of the Dove World Outreach Center, Trinity’s near neighbor, announced plans to publicly burn the Koran on the anniversary of the 9-11 bombings. Johnson’s impetus may have been to deal with the crisis, but the result has been and continues to be ongoing and potentially transformational. However, when members reported children wearing “Islam is the Devil” T-shirts to school and the news media picked up the story, Johnson felt compelled to respond. Eventually the story was picked up by CNN and Dove’s “International Burn the Koran Day” became a news juggernaut that would not go away. Johnson drafted a press release that became a collective statement endorsed by the Trinity Church council. It eventually became an “Interfaith Gathering” hosted by Trinity the day before the scheduled 9-11 burning. “I felt like my senior minister role led us into a community thing,” he said. Trinity’s September 10 event, “A Gathering for Peace, Understanding and Hope”, brought people of all faiths into Trinity’s sanctuary. Hundreds of people and over 40 news agencies showed up, including Al-Jazeera. The Rev. David Allen, Trinity’s associate pastor, saw the gathering as a release valve for community tension. The peacemaking initiative had the effect of transforming the world at a particular place and time. And the ongoing work of the interfaith forum is committed to continue building relationships. Contact Dan Johnson at www.trinitygnv.org. Contact the Rev. Victor Cyrus-Franklin at www.epfm-umc.org.